I didn’t even know moldavites existed until last year. One of the highlights of my trip to the 3RF Messier Marathon in the spring of 2017 was seeing Jeff Barton’s meteorite collection. He set it out for us to peruse one day, and it covered a classroom’s worth of tables. I barely knew from meteorites back then–hadn’t caught the bug yet–but a few things stuck in my head. One was his collection of Chelyabinsk meteorites from the 2013 airburst. Another was his collection of tektites. I knew what tektites were in general, but I’d never seen any firsthand. 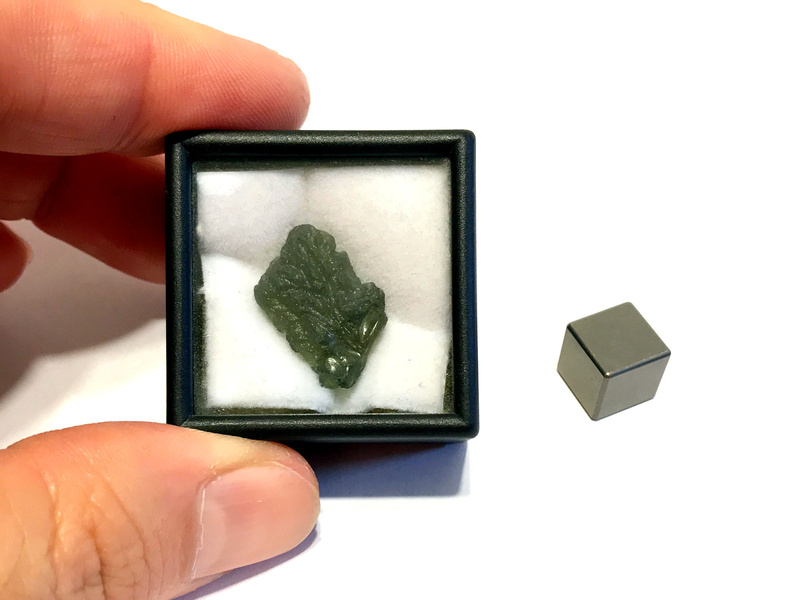 Jeff had a really nice, good-sized moldavite and he encouraged us to hold it up to the light so we could see that it was translucent glass. I got a few snaps of that and I definitely remembered it. A couple of months later I was driving back from a museum visit in Mesa, Arizona, with a colleague, and we stopped for lunch and gas. There was a rock shop across the street so I thought, “What the heck” and went in. Amongst the other treasures was this little moldavite in a little display case. 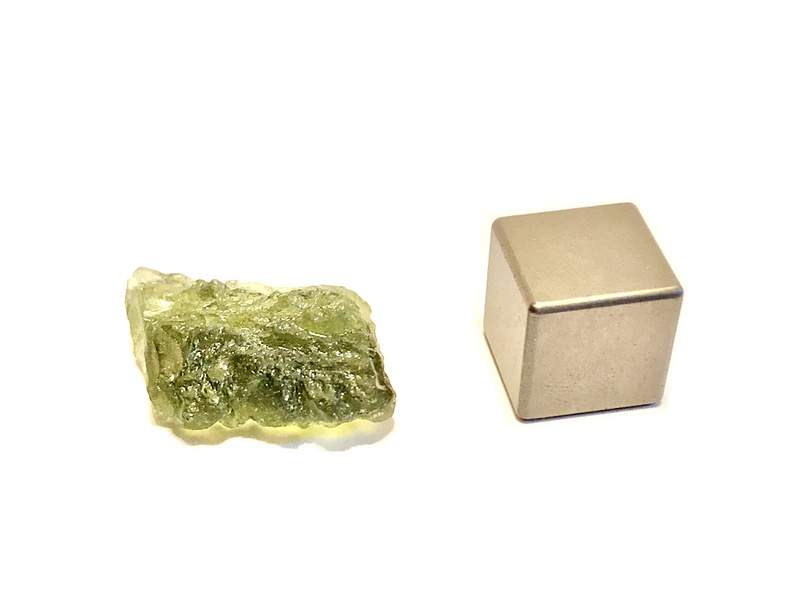 I checked it out carefully–there is a burgeoning market for fake moldavites, but most are easy to spot as cast glass. All signs point to it being genuine, so I bought it as a souvenir of the trip. Fifteen million years ago, a massive impact in what is now southern Germany created the Nördlinger Ries crater, which is 24 km (15 miles) across and still up to 150 meters (~500 ft) deep, despite considerable subsequent erosion. The impact scattered showered tektites over a vast area of east-central Europe, including parts of southern Germany, Austria, and the Czech Republic. Moldavites are typically green. They draw their name from the Moldau River in the Czech Republic, where the first pieces to be scientifically described were found. 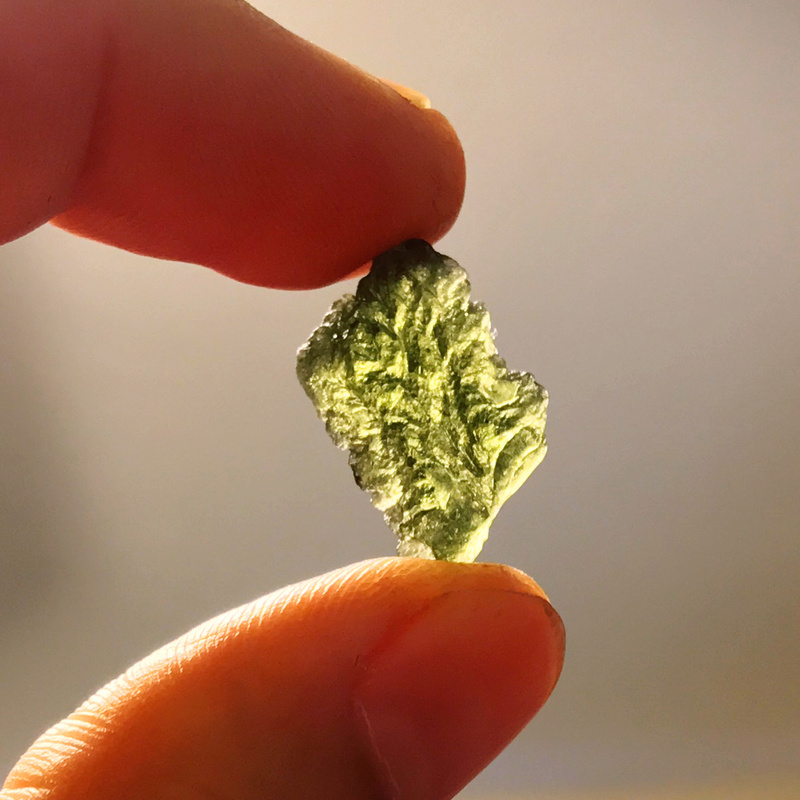 This moldavite is one of my favorite pieces in my little collection. At outreach events I encourage people to hold it up to the light, and it never fails to impress. It’s strange, but satisfying, to hold a piece of glass 15 million years old. the Chesapeake Bay impact on the east coast of North America, about 34 million years ago, that produced a North American strewnfield (bediasites, georgiaites). Libyan desert glass from the eastern Sahara, inferred to be the result of an impact or airburst about 26 million years ago (strictly speaking, probably a surface melt rather than melted material thrown through the air). If you know of a tektite strewnfield or impact glass site that I’ve missed, please let me know in the comments. You are currently browsing the 10 Minute Astronomy blog archives for the day Thursday, October 4th, 2018.